To heal in any RPG is to restore lost "hit points" or life. It usually involves magical spells or similar effects, such as short periods of time or eating supposedly non-magical food to increase. There are many methods of healing in Diablo 3, from health orbs to health potions to healing procs on items, such as Life Steal, Life on Hit, Life After Each Kill, or Regeneration. Click here for the Templar skill "Heal." 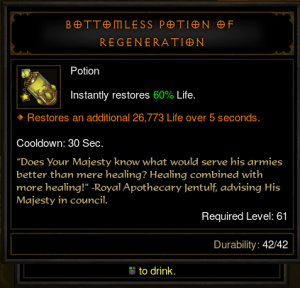 Health potions are found in Diablo 3, both of a basic type and also Legendary Potions which heal and add other special effects as well. Potions in Diablo 3 work differently than they did in Diablo 1 and Diablo 2, and can not be spammed. Health potions have a thirty second cooldown in D3, and thus must be used strategically and sparring. In lieu of drinking "pots" as was the practice in Diablo 1 and Diablo 2, most healing in Diablo 3 comes from item properties, paragon points, and the health globes that monsters drop. Reaper of Souls made a major change to health potions. Initially in D3v, there were a dozen different types of potions, each providing a set amount of healing. The amount increased at higher levels, and players had to constantly upgrade the type potion they were carrying (much as higher quality gems are dropped at higher levels). Reaper of Souls simplified this and removed all the different types of potions, changing to one basic health potion that restored 60% of a players maximum hit points. Legendary Potions heal just the same, but add temporary buffs to other defensive properties, such as increased resistances, life regen, defense, resource regen, and more. Life Steal was the most powerful form of healing in Diablo 2, and that carried over into Diablo 3. Life Steal worked on a percentage basis, where X% of the damage a character dealt was turned into life for them. Since this sort of property scaled up with character damage, it tended to become very powerful at high levels in good gear, and in D3v this made it much more useful than properties such as Life on Hit, where a character gained a set amount of life with each successful hit. Reaper of Souls attempted to make healing more dynamic by removing Life Steal from the pool of item affixes so it would not spawn any longer. The devs further reduced the effect of Life Steal to 10% for characters from level 61-69, and turned Life Steal off completely at level 70. In many RPGs there are dedicated caster classes for healing, who tend to have limited offensive capabilities and add their value through healing or otherwise buffing party members. In Diablo II, there were a few classes with some sort of "heal other" spells, but not overly efficient. No class in Diablo II is a dedicated healing class. The popular MMORPG World of WarCraft has several classes that can specialise into healing, but they can also generally specialise into something else, like DPS or tanking. This is not the case in Diablo 3 and while the different classes have many ways too heal themselves, there is little direct healing of other players, either via skills or item procs. Most party buffs take the form of increased damage or attack speed, with defensive party buffs more about damage mitigation in terms of increased resistances or defense.